Cold work tool steels are used for punching, cutting, forming, cold forging, cold extrusion, cold rolling, etc. Those steels have higher hard phases like carbides and plate martensite compared to other steel alloys, but the everlasting challenge is the enough strength to toughness relation, without immediate fracture. Carbides provide the wear resistance, acting as hard precipitates inside the structure of steels. Variation in size and fraction of carbides, depending on manufacturing route, alloy content, hot working and heat treatment, will give the tool steel the desired mechanical properties. However, conventional cast tooling is the major production route used, which could be followed by a process called electro slag refining where not only the nonmetallic inclusion content is lowered but also the texture of steel is modified. Conventional casting of tool and die steels has a lower production cost per unit than the conventional processing routes. The disadvantage though is a more heterogeneous material, due to segregation of primary or leduburitic carbide net cells. 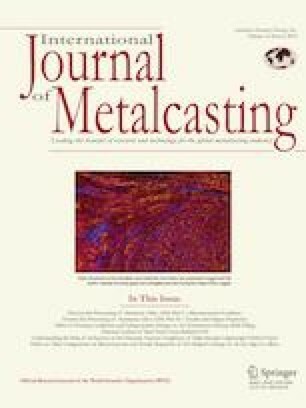 Experimental trials were made to control the distribution and morphology of primary carbides in the matrix of martensite by spheroidizing them through molten metal treatment by using FeSiMgRe ferroalloy additions and heat treatment processes. Types and distributions of different carbides in the matrix of cast D2-steel were detected using X-ray diffraction and SEM/EDX units. Series of carbides like (FeCr)7C3, (FeCr)3C and (FeCr)4C were detected. In all cases, the optimum tempering conditions were found to be (300 °C, 5 h, air cooling), which in turn insured hardness of about 59–63HRC for cast AISI-D2 steel. 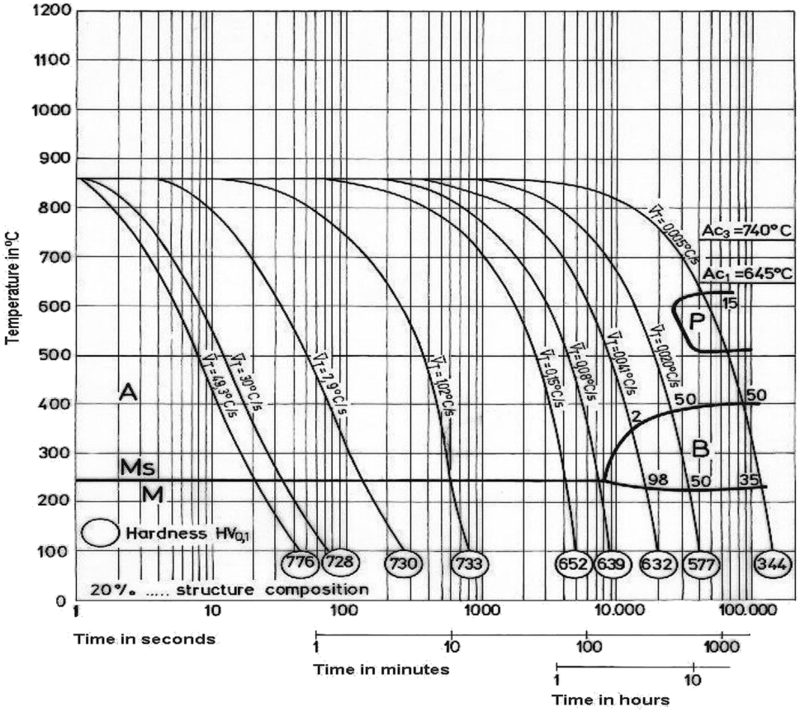 The fracture index for that hard matrix was Kic = 70–60 MPa √m, and impact energy = 54–35 J was achieved. In this group of steels, many manufacturers market steels of composition adjusted to meet specific requirements. Undoubtedly, this group of steels can be classed among the largest tonnage used for tool manufacture, the reason being that it is the least expensive; affording a high degree of non-distortion in heat treatment and for short-run application cannot really be rivaled. Fortunately, cold work tool steels include the high carbon; high-chromium steels are designated as group D-steels and consist of D2, D3, D4, D5 and D7-steels. These steels contain 1.5–2.35% of carbon and 12% of chromium. Except type D3-steel, the other entire group D-steels include 1% Mo and are air-hardened. Type D3-steel is oil-quenched; though small sections can be gas-quenched after austenitization using vacuum. As a result, tools made with type D3-steel tend to be brittle during hardening. However, type D2-steel is the most commonly used steel among the group D-steels which contain carbon up to 2%, chromium up to 13%, molybdenum up to 1.5%, cobalt up to 1%, vanadium up to 1.2% and Mn + Si in the range. These steels have higher hard phases like carbides and plate martensite compared to most other steels, but the everlasting challenge is the enough strength to toughness relation, without immediate fracture. In this investigation, a trial was made to control the distribution and morphology of primary carbides in the matrices of D2-cold work tool steel by spheroidizing them through molten metal treatment process and heat treatment. Types and distributions of different carbides in the matrix were measured using X-ray diffraction and SEM/EDX units. Industrial performance has been recorded for the optimized pressing dies as compared with the same imported dies created through the conventional forged or rolled-machined ones. Hardness and fracture strength were measured for experimental specimens representing the actual working die. In this research, standard steel strips 40 × 40 × 300 mm of grade AISI D2-cold work tool steel, as given in Table 3, were re-melted in a coreless medium-frequency, first-heat high-alumina-lined induction furnace. The furnace was covered with a lid during melting to minimize the oxidation process that can happen from the atmospheric air. After complete melting and final analysis control, the melt (1520 °C) was tapped into intermediate preheated experimental ladle, skimmed and poured into the cast designed molds required, or the melt was poured upon a bed of about 20 kg/ton FeSiMgRe ferroalloy (5%Mg + 3%REM + 35%Si + Fe) granulates (1–3 mm) placed in the bottom of the ladle and covered with thin normal steel plate (sandwich method). The flow diagram for melting, treating, casting and heat treatment of the steel under investigation is shown in the schematic representation of melting log, as shown in Fig. 1. The ferroalloy melts and evaporates causing exothermic reaction which increases the melt temperature to about 1560 °C, at which the ladle was left to calm and cool down to about 1520 °C, skimmed and then poured into the casting cavities. The treated castings were removed from sand at 1020–1050 °C to be hardened using forced air cooling. Some samples from the cast steels were cleaned with a shot blast machine and then prepared for further microstructure examinations and mechanical properties testing, while other samples were subjected to spheroid-annealing heat treatment and then prepared for further examinations. 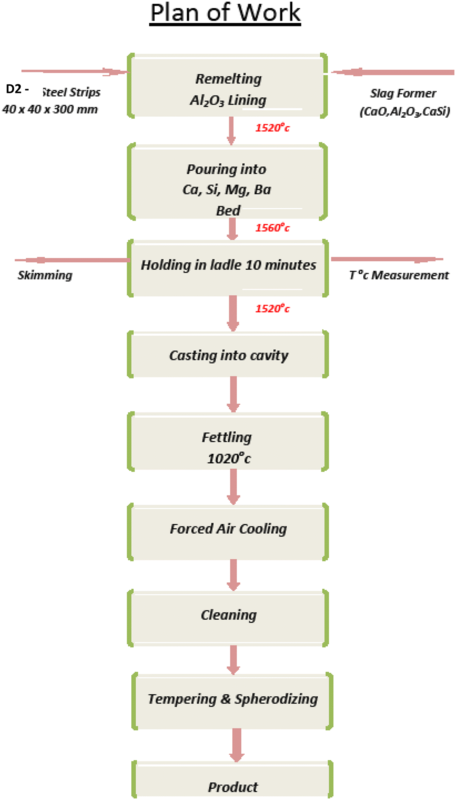 Flow diagram of melting, treating, casting and heat treatment of cast-D2 cold work tool steel. After the treatment of steel melts, the chemical compositions were adjusted to be nearly the same as for “AISI-D2 steel” standards by adding FeCr, FeV, FeMo, FeCo and low-sulfur carburizer. After casting, the experimental specimens were cleaned thoroughly using blast shooting, trimming all gating system and then prepared for heat treatment. The heat treatment comprises low-temperature spheroid annealing at 450 °C (high-temperature tempering) to help in spheroidizing more eutectic carbides which, in turn, increases ductility of high-carbon steel, and spheroid structure reduces the energy needed for subsequent operations and machinability is also increased.13 The press dies were then prepared to be mounted to the production cutting and forming system as shown in Fig. 2. Produced D2-cast dies (heat-treated to 60HRC, machined, grinded and ready for mounting). Microstructure of slowly sand-cooled cast D2 tool steel. It is evident from Fig. 3 that the high-C–Cr alloys solidify as primary austenite dendrites with a network of inter-dendrite eutectic carbides and during cooling some of the eutectic austenite around the eutectic carbides transforms to martensite. In order to break down these eutectic, continuous and interacted carbide nets, an experimental idea to change the equilibrium conditions of the molten steel was applied. The molten steel was poured onto a sandwich bed of FeSiMgRe granulates which immediately melted and evaporated at pouring temperature creating exothermic reaction and a huge amount of gaseous pressure which alters the equilibrium conditions that creating another morphologies of carbides during cooling. 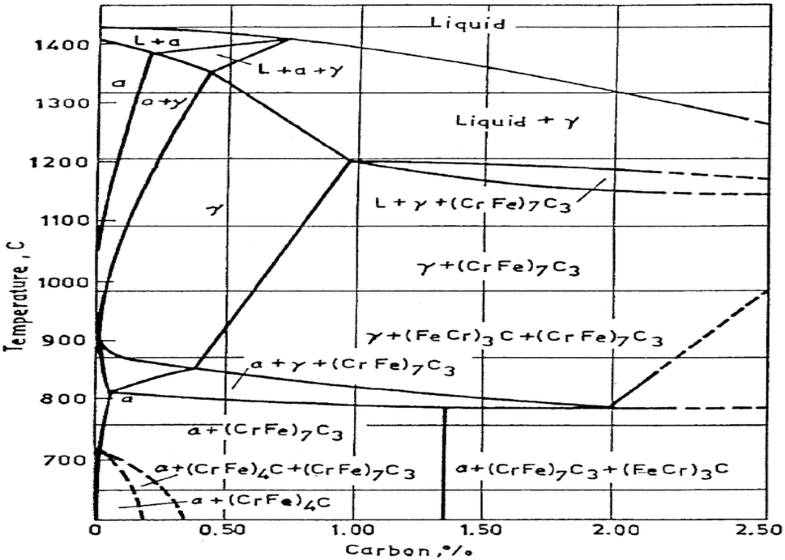 These induced non-equilibrium conditions create new carbide morphologies as depicted in Fig. 6. The primary purpose is to harden the whole matrix without heat treatment by destabilizing the austenite via precipitation of Cr-rich secondary carbides, generally at over 1100 °C for time of about 1–2 h depending on the alloy content,11 and then air quenching of the cast tool to room temperature. During forced air quenching, the austenite with less Cr and C content is forced to transform to martensite without any dimensional distortions as in the case of conventional heat treatment. 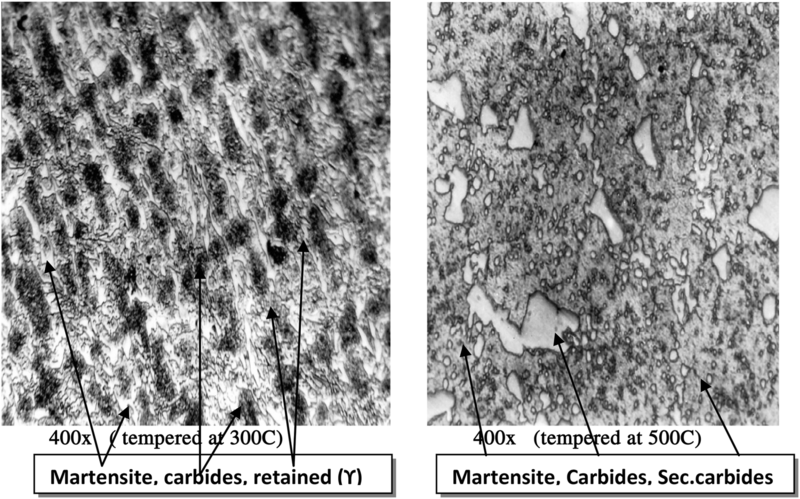 Distribution and morphology of carbides after treatment of molten D2-cold work tool steel. 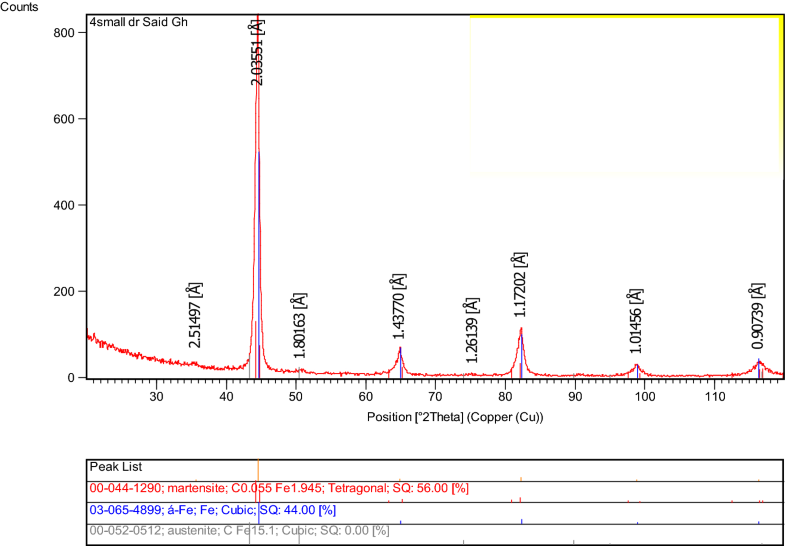 This gives a distribution of secondary carbides in a martensite matrix with small amounts of residual austenite as shown in X-ray diffraction curve in Fig. 12, and the hardness levels are increased to about 59–63HRC. This is so called destabilization heat treatment. Tempering heat treatment after destabilization at 300–550 °C for normally 3–5 h is to reduce the amount of retained austenite in the matrix. Microstructures of air-quenched–tempered, treated D2-cold work tool steel samples. Appearance of banded eutectic carbides in forged D2-steel and Cr-cast iron, × 400. Distribution of martensite, carbide and retained austenite in these treated, hardened and tempered samples was detected using X-ray diffractometer aided with comparison programs for pure phases. The measured reflections were automatically sorted as for austenite  between 48.5°–52.5° and martensite  between 75.5°–79.5° at step of 0.05° and measuring time of 20 s, as shown in Fig. 9. Phases distribution in treated–tempered D2-steel castings as revealed by X-ray diffraction. The hardness of the as-air-quenched and (300 °C-5 h) tempered matrix was in the range of 63–59HRC for D2- and D2-FeSiMg-treated castings, respectively, due to the transformation of austenite to martensite and the high density of induced–interacted dislocations; however, as the matrix subjected to tempering, ordering of dislocations took place and transformation of retained austenite to martensite happened depending on the tempering temperature and holding time as shown in Fig. 10. The holding time was chosen to be 5 h, while tempering temperatures were chosen to be between 100 and 700 °C. 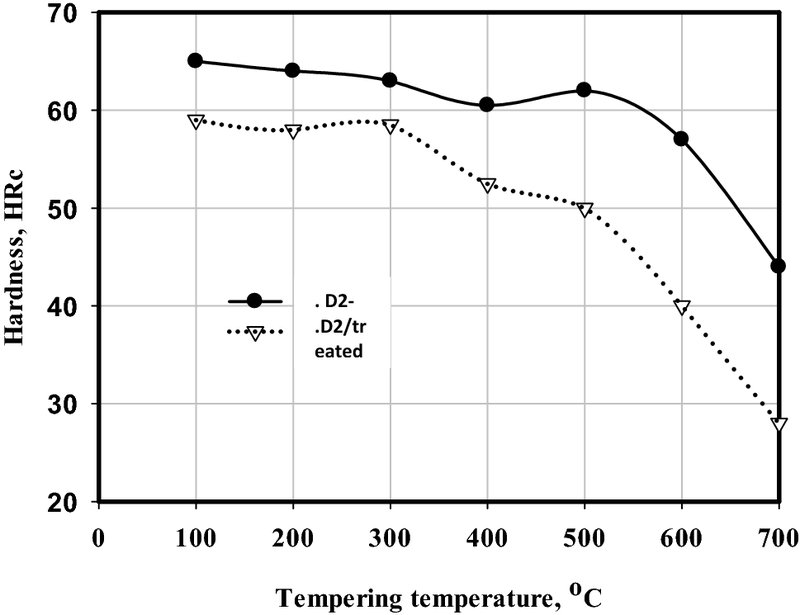 Dependency of hardness on tempering temperature for “D2-cast” and “D2-cast/REM” treated steels. Maximum softening was encountered at 400 °C while a gain of hardness of about 4HRC was observed for untreated D2-steel castings; however, continuous softening in treated D2-steel castings was measured to reach 50HRC after tempering at 500 °C. In all cases, the optimum tempering temperature was found to be 300 °C, which, in turn, insured hardness of about 63HRC for D2-untreated steels and 59HRC for D2-treated steels, respectively. Failure of dies used for blanking and forming is always due to fatigue fracture if the amplitude intensities approach the fracture toughness critical factor (Kic). Figure 11 illustrates the measured fracture and Charpy impact toughness for D2-produced experimental steel as a function of their different hardness after tempering. 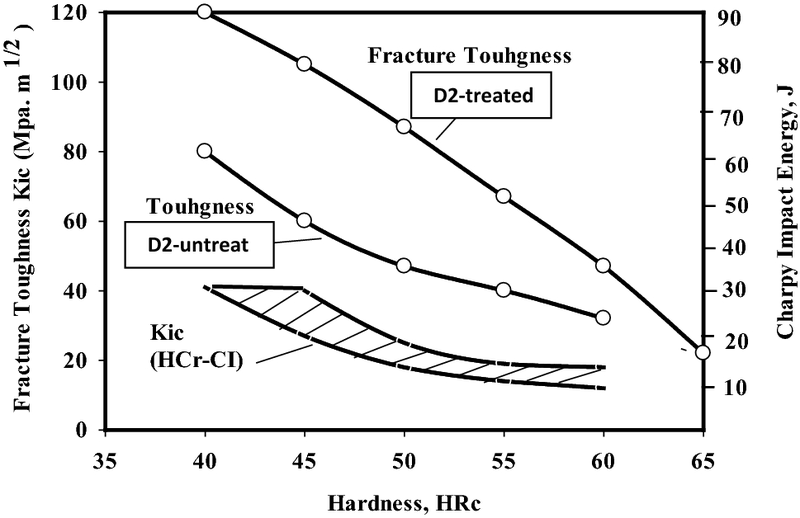 It is evident that as the hardness lowered, the resistance to form cracks increased and vice versa; however, at 55–60HRC hard matrix of D2-steel, the Kic factor reached to 70–60 MPa √m and impact energy 54–35 J which are good enough compared to those for high Cr-cast steel or cast irons (20–30 J). The presence of some dimpled and ductile facets in the fracture surfaces of treated D2-experimental die steel advocates the improvement in its microstructure and toughness, as depicted in Fig. 12. Fracture mode of hardened–tempered, treated D2-cast treated steel. In order to break down the eutectic, continuous and interacted carbide structure, the equilibrium conditions of molten steel were altered through pouring it onto a sandwich bed of FeSiMgRe granulates which immediately melted and evaporated at pouring temperature. This induced turbulence and pressure to increase helped to change the morphology of carbides during cooling. Hardness of about 59–63HRC was obtained for FeSiMg-REM-treated D2- and untreated D2-steels and also fracture index Kic 70–60 MPa √m and impact energy 54–35 J were achieved, which are good if compared with those for high Cr-cast steel or cast irons (20–30 J). The fracture mode of the experimental treated D2-steels revealed the presence of some ductile areas led to upgrading their working lifetime. These ductile facets resist splitting and cracking of the dies even when abrupt pressing forces were applied.